The programmable logic controller (PLC) is considered by many to be the most important development ever in industrial automation, because it is a prepackaged, industrially-hardened computer that can be quickly programmed to control a wide range of industrial processes and machines. Typical applications include: robots, conveyors, electric motor controls, air conditioning, process control, plastics injection molding, and CNC machines. Amatrol’s tabletop PLC training system (85-PS7312 / 85-PS7315) teaches how to program, operate, and interface programmable controllers in a variety of industrial applications. 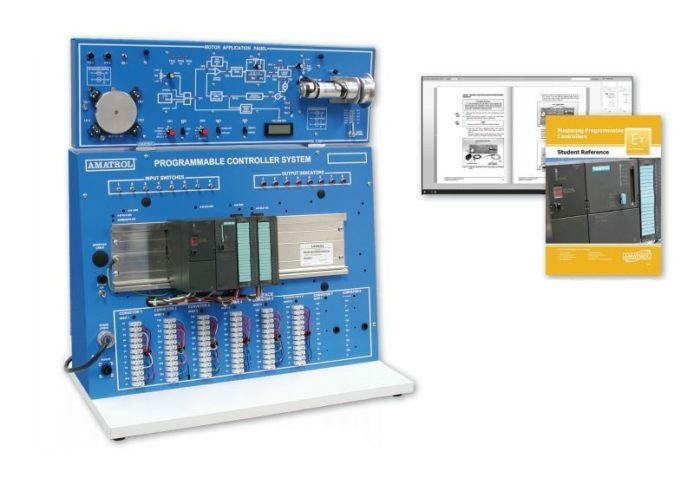 The tabletop PLC training system includes a metal, silk-screened enclosure mounted with an industrial quality Siemens S7 programmable controller (S7312 or S7315). The system is designed to teach programming and real-world applications of input and output devices. For example, the system can be programmed to provide control of electromechanical and pneumatic devices. The tabletop PLC training system includes a unique plug-in terminal strip system, which students can easily use to connect the PLC I/O to a variety of external application devices. Each terminal strip point includes a plug-in receptacle for single point interface by a lead with a solid pin jack. This is ideal for connecting small quantities of inputs and outputs that are not always connected to the same I/O. For applications where more I/O must be interfaced, a mating terminal strip with pre-wired I/O can be plugged into the terminal strip. This provides a fast and reliable method of connecting the PLC to an application. Each point also features test point access to support electrical troubleshooting measurements.